See more objects with the tag personal, timekeeping, personal adornment, electronic, numbers, dials, gears. 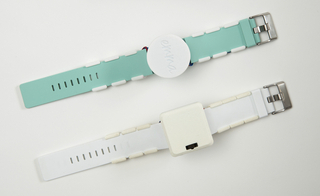 This is a Watch. It is dated 1966 and we acquired it in 2011. Its medium is stainless steel, plastic, electronic components. It is a part of the Product Design and Decorative Arts department. 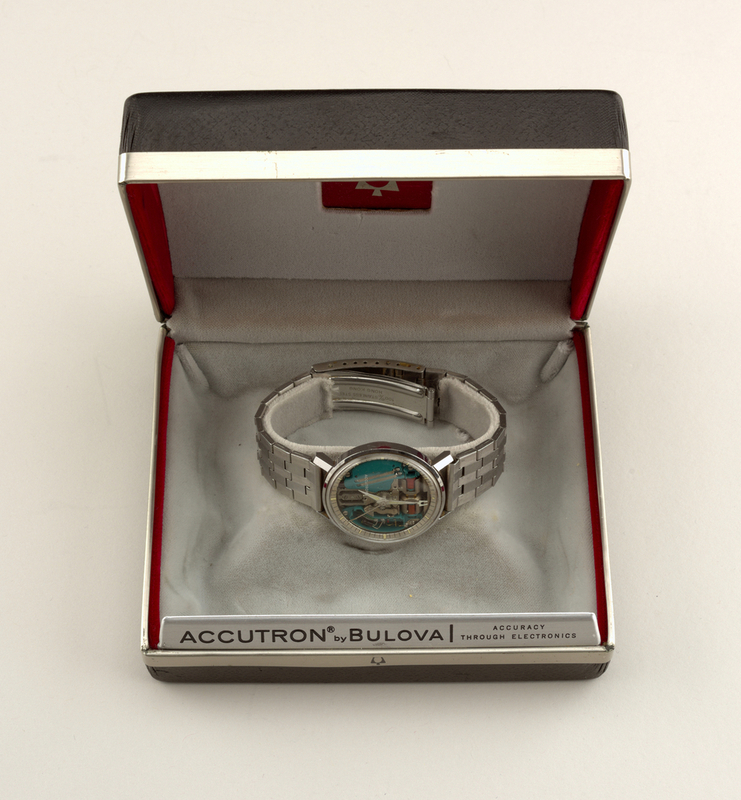 The Accutron was not only the world’s first electronic watch—it revolutionized the watchmaking industry. Invented for Bulova by Swiss engineer Max Hetzel, the Accutron was also the first acoustic frequency wristwatch, using a miniature electrically-activated tuning fork instead of conventional mechanical movements, such as a balance wheel and escapement, which had been the standard in clocks and watches for over 450 years. Traditional watch movement has a frequency of about 2Hz (two cycles per second) and produces a ticking sound. The tuning fork movement of the Accutron had a frequency of 360Hz, which produced the watch’s distinctive hum and sweep second hand, and kept time to an accuracy of within two seconds per day—about 10 times more accurate than a fine mechanical watch. The Accutron contained only 27 component parts and, of those, only 12 were moving parts. 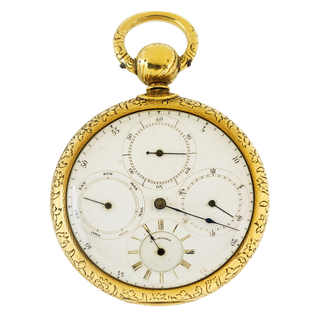 By comparison, the most efficient self-winding watches of the period contained about 136 parts, 26 of them moving. 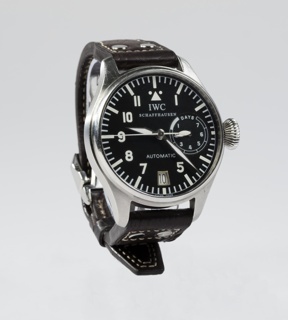 Developed over a period of eight years, first in Bulova’s Swiss factory, then at their headquarters in Jackson Heights, New York, the watch went into production in late 1960 and was an immediate success. Bulova sold almost five million Accutrons between 1961 and 1977, the year the company ceased manufacturing the watch and began directing its efforts at producing quartz watches, the next advance in timekeeping. This model, the Spaceview, introduced in stainless steel in 1962, is characterized by its thin, circular chapter ring (which Bulova called a reflector) with minimal lines and luminous dots in place of an opaque face with numerals. Its luminous thin tapered hands and large clear crystal bear only an abstracted image of a tuning fork (the Accutron logo) and the word “Accutron.” This minimal design allowed users a full view of the innovative tuning fork and electronic circuitry inside. This Accutron is a fitting addition to the museum’s collection and would enhance holdings in the category of timepieces, particularly examples from the mid-20th century, an era of many technological and design innovations. This object was donated by William Drenttel. It is credited Gift of William Drenttel. On crystal: tuning fork logo/ "ACCUTRON"; stamped on reverse of watch: "J79609" [serial number]/ "M6" [date number for 1966]; "Bulova/Waterproof/Patented/Stainless Steel"